The Nordic Region includes several countries and islands. Denmark, Norway, Sweden, Finland, Iceland, Greenland, the Faroe Islands, and Aland are all steeped in ancient history. Constant new discoveries prove that there’s still much to learn from this corner of the world. 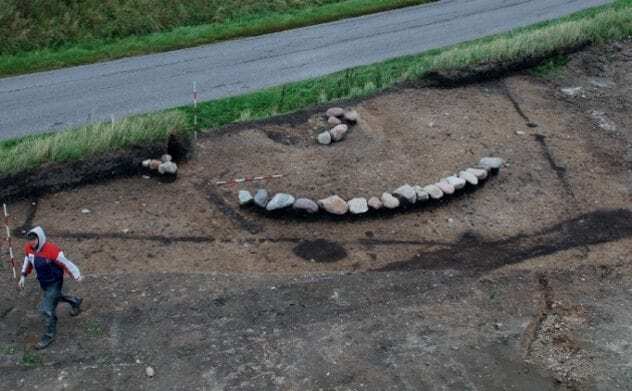 From mysterious settlers and circles to the graves of saints and ships to bloody battles, Nordic soil will keep archaeologists digging for a long time. In 2015, Goran Olson decided to take a breather while hiking in Haukeli in Norway, a popular place among outdoorsmen. Sitting down, he made an extraordinary find under some rocks: a Viking sword. Unbelievably, the weapon had remained undiscovered for over 1,000 years, despite being on a well-trodden trail. The sword was missing its handle and looked a bit rusty, but archaeologists were elated when Olson handed the artifact over to the University Museum of Bergen. Despite the damage, it’s still in exceptional condition. For something from the Viking Age, the sword is both rare and a valuable contribution. The high mountain pass where it resurfaced is packed with snow for at least half the year. This helped preserve the wrought iron blade and could have caused misfortune to its owner. It’s likely that the individual had an accident or succumbed to the weather while traveling the same ancient route that Olson did. Iron swords were difficult to manufacture, which made owning one a status symbol. 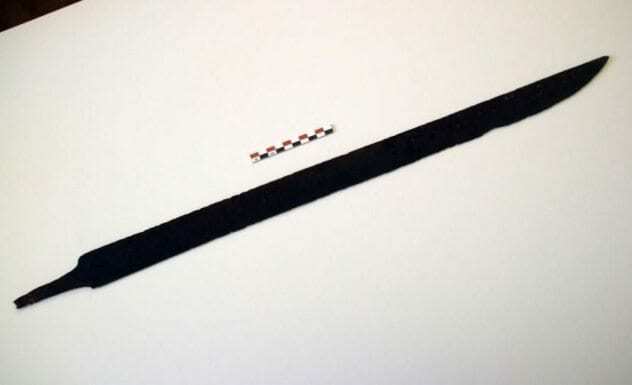 Roughly dating to AD 750, the 76-centimeter (30 in) sword would have belonged to a rich Viking. Here’s something you don’t hear every day: A Viking marauder became a saint. Olaf Haraldsson was born around 995, raided as a youth, and turned over a new leaf in 1013, when he was baptized as a Roman Catholic. Wanting to unite Norway, he became king in 1016 and established the Church of Norway a few years later. Olaf sought safety in Russia when Canute I, the king of England and Denmark, added Norway to his kingdom. Olaf died during battle, trying to retake the throne in 1030. He was buried in Trondheim. Within a year, locals claimed that the dead king caused miracles. Church teachings tell of how when the royal grave was opened and Olaf’s corpse was found unnaturally well-preserved, the local bishop made Olaf a saint. His body was moved to St. Clement’s Church. The pope officially recognized Olaf’s sainthood in 1164. Archaeologists believe that they’ve located his final resting place. 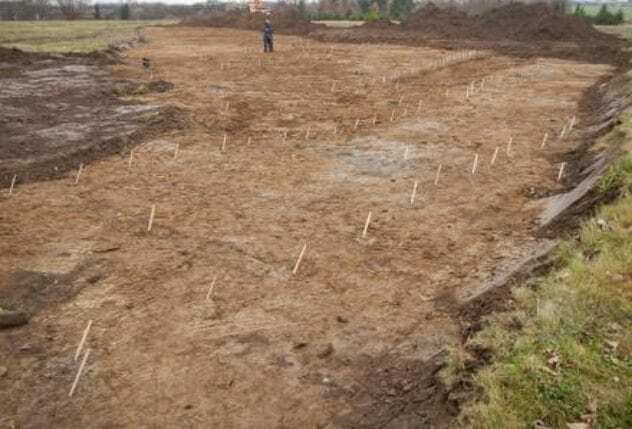 In 2016, they discovered the stone foundations, a sacred well, and a rectangular rock platform that could be the high altar constructed over St. Olaf’s final grave. Another high-ranking Viking’s tomb was discovered in Denmark. Unlike St. Olaf, Ulv Galiciefarer became notorious for the usual reasons: He terrorized Northern Spain. Looting and pillaging kept the Viking chief busy. Galiciefarer was also the great-grandfather of one of Denmark’s kings, Valdemar the Great, who ruled from 1157 to 1182. Archaeologists unearthed a tomb in 2009 that had all the signs of an important person. There’s a chance that it might even be Galiciefarer’s grave. The site matches other noble tombs in the area of Naesby in Jutland. Written history calls the chieftain an “earl of Denmark,” which would have called for a stately burial. Royal graves from the time were covered with a building. While there was none at the newly discovered site, a large square in the ground shaped the foundations for one. A sword from the tomb indicated that the person lived during the first half of the 1000s, fitting with when Galiciefarer lived. The land was also Valdemar’s ancestral property, making it likely that Valdemar had Galiciefarer buried on family land. 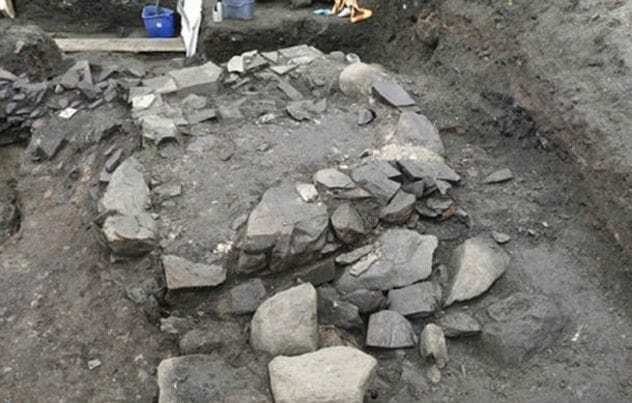 In Stjordal, a team of archaeologists excavated what looked like normal burial mound in 2010. Things turned interesting when they realized that the ancient builders had used a hill as a foundation, shaving time off construction and raising the mound higher than normal. 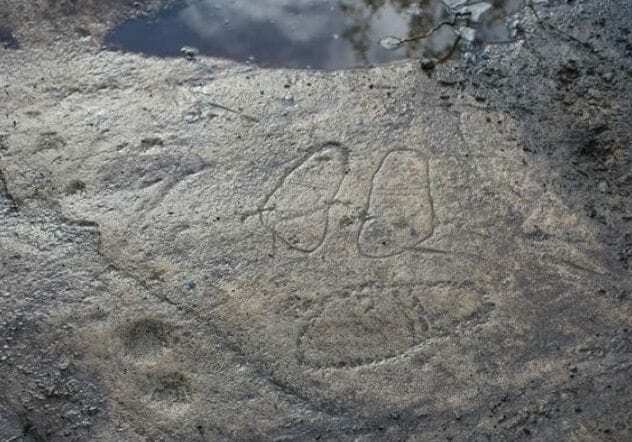 Then they discovered unexpected petroglyphs. Beneath a layer of what appeared to be a double cremation were eight carvings depicting the soles of human feet and five slightly sunken areas. Researchers believe the grave was ritually built over the drawings, which date to the Bronze Age (1800–500 BC). The exact meaning of the feet remains a mystery. 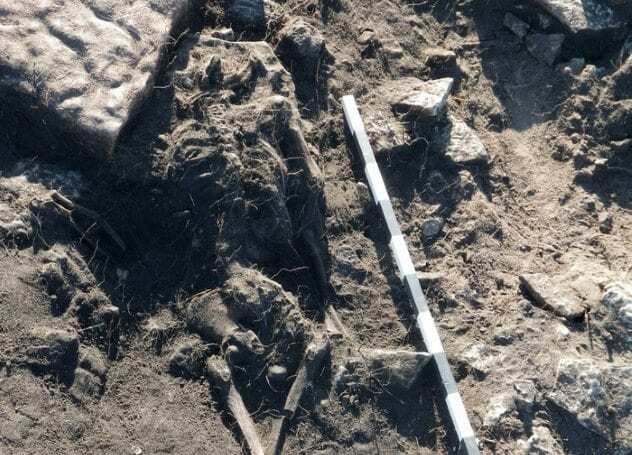 A nearly identical find was made in Ostlandet County, also with illustrated soles beneath a Bronze Age tomb, but this is the first to be found in Stjordal. 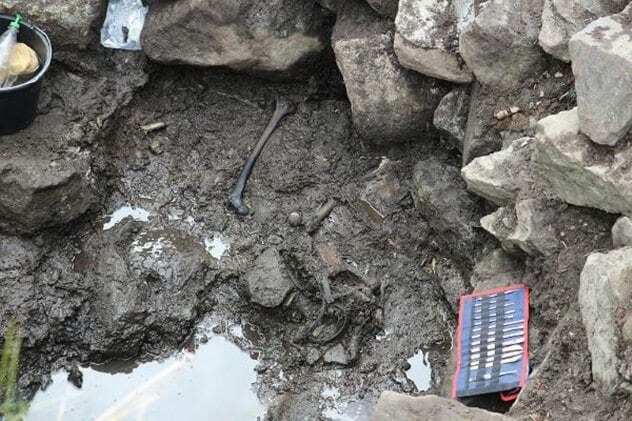 The excavation also produced scorched animal and human bones from several individuals. A little south of the tomb, which dates between 500 BC and AD 1, were more drawings of soles, this time with toes and a pair of boats. Between Norway and Iceland are the Faroe Islands. Called the “steps to the Americas,” the isles allowed Europeans a foothold in the Atlantic before colonizing the continents. Historical accounts place the Vikings as the first arrivals. 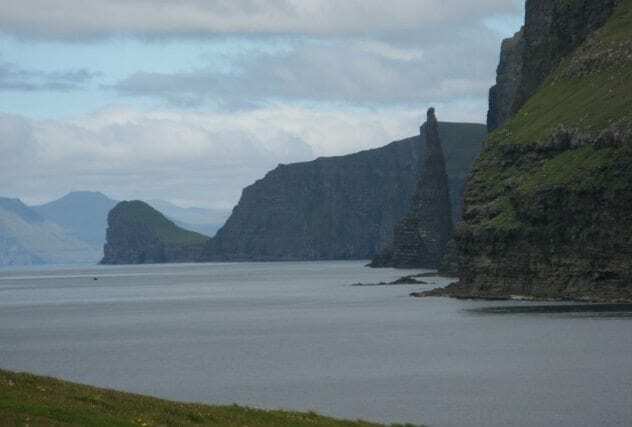 In 2013, however, researchers found signs that somebody reached the Faroe Islands 300–500 years before the Vikings. Whoever these mysterious pioneers were, they didn’t settle en masse like the Vikings would later do, but they stayed for a long time. On the island of Sandoy, they dusted the dunes with ash, a known technique used by ancient Europeans to steady sand and prevent wind erosion. The ash contained barley grains dating to a pre-Viking era. Barley was not native to the island and had to have been cultivated or imported. There are the first hard archaeological traces of a colony that history forgot. The find raises the question of how many other unknown companies explored the North Atlantic territories and when. A fascinating phenomenon in Nordic countries are palisade enclosures. In Denmark, near Stevns, one hugs the landscape with such epic proportions that it stunned archaeologists in 2017. Built in the Stone Age, it runs like a strange labyrinth over an area of 18,000 square meters (200,000 ft2). Several palisade rings make up the interior. The timber palisade’s center yielded sun symbols and possibly a solar temple. A second, similar construction also exists on the island. More palisades dot the fields in Denmark’s East Zealand and Falster as well as in Skane, Sweden. In 1988, some of the most intriguing sites were found on the Danish island of Bornholm. The Bornholm sites are the only palisades with any connection to ritual and worship. They are also older than Stevns, which was probably erected from 2900 to 2800 BC. Archaeologists don’t know why palisade patches were created, but they were obviously important. Despite their differences, they enclosed something, perhaps of religious value, like the Bornholm temples. In 2014, an energy company was laying cables under the sea when they found Denmark’s oldest boat. The wreck was tucked away near Asko Island. The 6- to 7-meter-long (20–23 ft) treasure is thought to be 6,500 years old. That’s almost two millennia older than Egypt’s most ancient pyramid. Thousands of years of being submerged have done their damage, but scientists got excited over a particular crack, which formed when the vessel was brand-new. The owners had attempted to cure the problem by drilling holes around it and plugging the split with a piece of bark. Remarkably, the 2-millimeter-wide bark and sealing mass inside the holes survived. Connected to the boat discovery was another submerged find. A complete Stone Age village sits nearby beneath the waves. 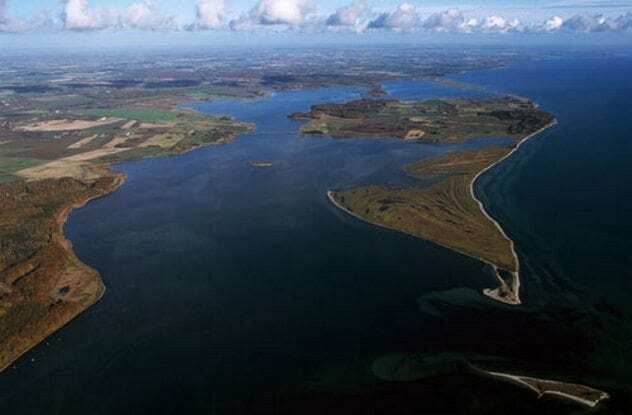 One day, the settlement might help researchers redraw Denmark’s coastlines the way they looked thousands of years ago. The Kongesagaer is a collection of tales about medieval Norwegian kings. Historians have long been wary about how much is authentic recollection and how much has been embellished. Now, one story appears to be true—very true, in fact. Sverre’s Saga tells of a defeat that King Sverre Sigurdsson suffered in 1197 at his own castle, Sverresborg. After burning down the buildings, the Baglers threw one of the king’s mercenaries down the well to spoil the stronghold’s drinking water. The Baglers then topped up the well with stones. In Trondheim, Norway, archaeologists were clearing debris from a well belonging to the ancient castle when they found human bones at the bottom in 2016. Radiocarbon testing placed the person’s lifetime during the last part of the 12th century. That slots perfectly into the saga’s time line. The individual who ended up in the castle’s water source is the only known example of remains that can be tied to an act of war as long ago as 1197. On the Swedish island of Oland, the Sandy borg ringfort once held a thriving community. But some 1,500 years ago, a number of villagers were massacred. The horrific event was unearthed when researchers began excavations in 2010. Initially, it was thought that only adults had stayed at the fort, but in 2014, two child victims were also discovered. Whoever ambushed the fort excluded nobody from the massacre, not even small kids. Aged two to five, they were found in a house with a male adult, who met with a particularly gruesome end. The 50- to 60-year-old was incapacitated in some way before he fell face-first into the home’s burning hearth. Due to a lack of finances, only three percent of the fort has been excavated, but it was enough to reveal the scale of the horror. In that small area, ten bodies were found, the two children among them. A lot more bodies likely await discovery. Whatever happened, the survivors abandoned the fort in such a hurry that they left valuable gold jewelry behind. In 2017, marine archaeologists found a vessel on the sea floor near the coast of the Swedish city of Karlskrona. Partially crushed and stuck deeply in the sediment, enough of the ship was visible to identify her. Experts are convinced that this is the warship Blekinge. The historic ship was the first to be built in Karlskrona and was put to sea in 1682. After 31 years of service, she sank near her home city during a campaign to defend Sweden from Russia. The wreck is about 45 meters (150 ft) long and packs around 70 deadly cannons. At this point, it remains too difficult to remove the vessel, due to its bad condition and depth in the sand. However, the Blekinge strongly resembles another famous warship, the Vasa (pictured above), in age and size. 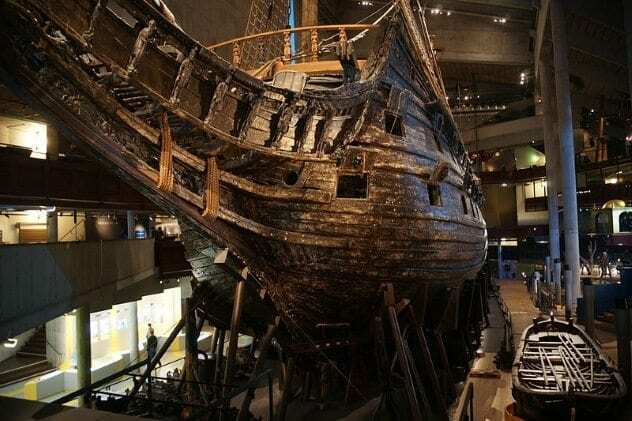 The Stockholm-built Vasa bubbled under during her maiden voyage in 1628 and is the only 17th-century ship to be raised from the sea almost completely intact. The 64-gunner has her own museum, and salvaged artifacts allow a rich glimpse into everyday Swedish life of the era.